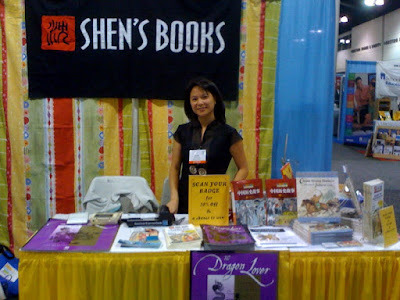 Shen’s Books is a publisher of multicultural children’s literature that emphasizes cultural diversity and tolerance, with a focus on introducing children to the cultures of Asia. Through books, we can share a world a stories, building greater understanding and tolerance within our increasingly diverse communities as well as throughout our continuously shrinking globe. Renee is a champion of children's literature, and I tune in regularly to the reflections and Multicultural Minute video series on her blog. "Anyone has the right to tell any story," she said emphatically when I asked about authenticity in fiction. That's good news for writers, readers, and a free society. How did Shen's Books get started? Shen's Books was founded in 1985 by a teacher named Maywan Shen Krach as a mail order catalog for Asian-themed books and teaching supplies. The first book published by Shen's Books came out in 1997, and since then Shen's has continued to publish two books a year. I have been the President of Shen's Books since 2001, when Maywan retired. We no longer distribute other books or supplies and simply focus on publishing now. How does Shen's Books make money as a small, independent publisher? Generally, we try to reach teachers and librarians directly through our catalog, conferences, and social media. Because when you're this small, every single book counts. Every person I meet at a conference or online makes a difference. Every teacher that learns about Shen's Books and then goes back to their school to advocate for our books makes a difference. And it goes without saying that creating the highest quality books addressing important themes and issues comes first. Name two of your bestselling books and tell us why you think they sold well. Our bestselling group of books is our Cinderella line. Almost every culture in the world has its own version of the Cinderella story, and we have published a series of books retelling a number of them. 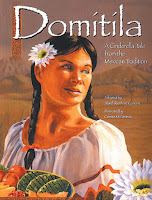 The bestselling book of these is Domitila: The Mexican Cinderella. All these books have the same beloved fairy tale at their cores, but they also show how different cultures all have a similar emotional basis in their folklore. They also reflect the landscapes and cultures of different places within a story that is familiar yet different. Describe a typical day in Renee Ting's life--if that's possible. If not, tell us what you did yesterday. My days tend to be full of minutiae, a million little things that fill timeand add up. I spend an inordinate amount of time on email, since every aspect of running a business seems to require it. I answer customer service emails and phone calls, and I check correspond with my authors and illustrators who have questions or need help. Yesterday I processed orders by typing invoices and placing the orders through our fulfillment warehouse. I also did some bookkeeping and sent a stack of 1099 forms to the IRS. I corresponded with a few printing companies regarding the quotes, paper stock, etc. for the printing of our next book, as well as totally different printing companies for the printing of our Spring catalog. I was able, though, to get a solid two or three hours in of designing the catalog, which needs to be sent off to the printer at the end of next week. Does an active online presence make a difference in whether or not you'll publish somebody? No. I look, first and foremost, at the quality of a manuscript. I'm happy to learn after the fact if the author has an enthusiasm for self-promotion, but it is not a prerequisite. Could you share a sample paragraph or two from a query letter that made your heart beat faster? We don't accept query letters, actually. Because we are only looking at picture books right now, I only accept full manuscript submissions. And generally, I don't look too carefully at the cover letter. I find that the manuscript should speak for itself. What's your view on "authenticity" or the question of who can write a multicultural story? I believe that anyone has the right to tell any story. The authenticity of the author's written voice is going to determine the quality of the book, not the author's racial or ethnic background. Naturally, if an author is close the subject and has done her research, it will be easier for her to attain an authentic voice than it is for someone who is writing about a subject they do not know well. I think this personal investment in a story shows through a manuscript loud and clear. On a more practical note, it is impossible for me to tell the race or ethnicity of an author just from their name on a manuscript. These days, we can't assume anything from people's names. And it just seems wrong to me somehow to judge work based on any criteria other than its own merit.